Well, here we are again. Another year has streaked across the calendar and the annual Northern Colorado Writers conference is now on the horizon. On my Richie on Writing blog from 2013 I discussed the change of status for the third conference I attended. I also predicted I would be the keynote speaker. Well, I didn't make it up to the head of the table, but I'm getting pretty close. It's interesting and a bit scary on how far I've come since my first conference in 2011. I had moved my family from Delaware a few months before and was still trying to find my comfort level in Northern Colorado. I can't recall how I found out about Northern Colorado Writers or the conference -- probably heard it from a guy waiting in a dark alley in Old Town Fort Collins right before he tried to sell me some authentic Swatches. I never belonged to a writers group on the East Coast, nor did I attend a single conference. Yet here I was signing up for a NCW membership and a seat at the conference. Back then I knew Kerrie as that woman who ran from room to room taking pictures of everyone. Now I'm her Assistant Director at NCW. Back then I entered the atrium of the Fort Collins Hilton not knowing a single soul. Today I'm pretty sure most NCW members know me due to my presence at most events as well as the various electronic media outlets. Back then I didn't know what a critique group was all about. This year I celebrate three years with my present critique group and have become its moderator. Back in 2011 I had a bunch of story ideas and chapter fragments. Today I have one book published, a second on the way, and I've started my own self-publishing company. I'd like to use a colorful phrase I learned in my years living on the East Coast; however, because this is a family blog the best I can do is say Holy Heck. 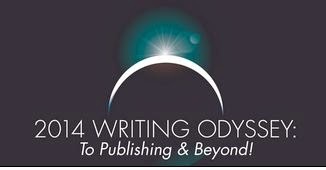 Regardless of where you are in your writing life, I hope to see you at the 2014 NCW Conference. Come and find me if you plan on attending -- I'll be the one with the smile on my face. Are you attending this year's Northern Colorado Writers Conference? Self-promotion alert: My first novel, Paradise Not Quite Lost, is now available for sale at Amazon.com. Just follow this link to obtain a copy. I live in Montana and have attended (and thoroughly enjoyed) the past two NWW conferences. Sadly, this year the conference is during our children's spring break so I will be peering over the rim of the Grand Canyon while you are listening, learning and loving the comrade of other writers. I will be back in 2015 whether it is spring break or not. Perhaps you will be the keynote speaker then! In the meantime, have a great conference! Oh--and congratulations on the book, Rich! Will definitely check it out!